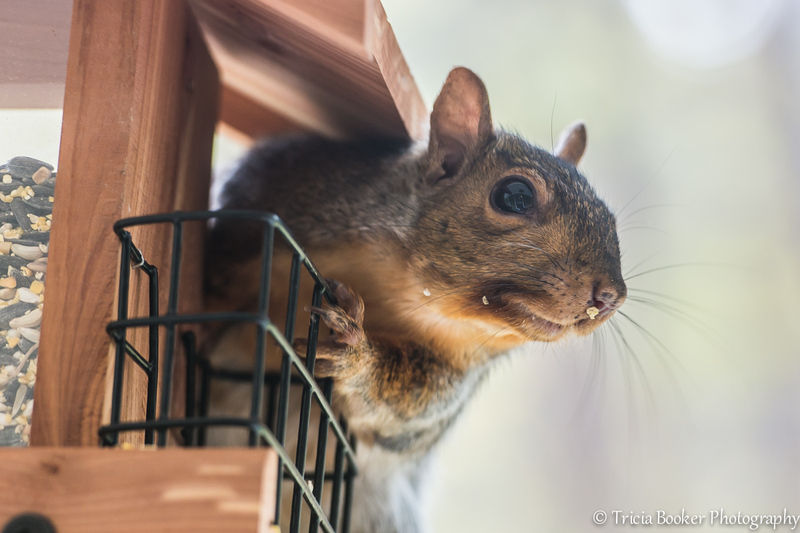 The squirrel in the bird feeder is one of my regular challenges, and although I’ve seen squirrel feeders at the farm and garden stores, I’ve not yet purchased one. I have a feeling that the squirrels would simply bypass the obvious, because I believe they enjoy the challenge of scaling the front porch railings, leaping across the abyss to commandeer the feeder and chasing off the birds. Although it might not be an unusual juxtaposition in the scheme of things–and I’m sure the Weekly Photo Challenge will have some cool entries–it’s the one I deal with nearly every winter day! Pingback: Day 14: Snow Leopard, Dublin Zoo | Weekly Photo Challenge: Juxtaposition | Dublin + 1 picture = 365 days! I don’t know why the squirrels have suddenly become bigger pests on the bird feeders. Maybe their food storage is running out or the snow is too deep for them to get to it, but they are on those bird feeders more than the birds are these days. For the past several days they’ve been conspicuously absent. Perhaps it’s the 6+ inches of snow still on the ground. Maybe they don’t want to get their feet wet! Love this photo. Great choice for this challenge Tricia. Tell him/her to wipe the crumbs of the face, it is a give-away…. Ha ha! Yes, the crumbs made me laugh when I first saw this image. At least if you’re going to eat my expensive bird seed you could be polite about it! Thank you for spending time on my blog! I appreciate the time you took and the posts you liked. Happy New Year to you as well, and I’ll look forward to a return visit! Squirrels on the squirrel proof feeder is the classic squirrel picture. I am starting to wonder if there should be more truth in the advertising as in 1) the squirrel can’t destroy this one but can still feast like a king or 2) the squirrel can’t destroy or eat seeds from this one! LOL! I did have one squirrel proof feeder that worked, but it was expensive and the neighborhood bear destroyed it within the month. I haven’t replaced it. Now, I just try and hang the feeders out of their reach, which is tough. They are amazing little acrobats!